To view 37 more pictures, aerial photography, interactive maps and the full, detailed description of the Regency Estates community, please Login. A walk down Main Street in this quaint little town could make you believe you were in a Norman Rockwell painting. Downtown streets lined with candy-colored buildings of pink, yellow and cream, topped with stripped awnings beckon passersby to check out the local wares. You could enjoy lunch at a family-run restaurant where the servers and patrons alike call one another by name. Is it possible such a place exists just outside the hustle and bustle of Hampton Roads? 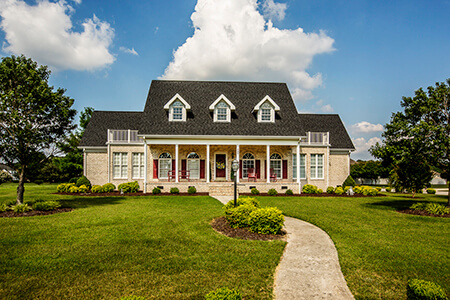 Tucked away in Franklin VA, a community called Regency Estates is just the place. On any given day, you could find yourself rubbing shoulders with your neighbors at the weekly farmers' market on Main Street. Or watch the sun go down while listening to live music at a concert-in-the-park near the Blackwater River. Regency Estates is a new-construction community with homes boasting updated amenities like open floor plans, kitchen islands, granite counter-tops, screened-in porches, cathedral ceilings, first floor master suites and hardwood flooring. Regency has maintained its historic charm and small town atmosphere, while growing to adapt to modern life. If you are looking for green spaces and larger lots, this is the place for you. A home in Regency not only offers you more value for your money, but more quality for your life. Building a home in this community would give you the country-living experience complete with outdoor sports like hunting with the many local hunting clubs, as well as water sports and fishing on the Blackwater or Nottoway River. There are also many other family-friendly opportunities. A state-of-the-art YMCA with a 25'×75' heated indoor swimming pool as well as an outdoor pool, tennis courts, and gymnasium that features year-round family activities. Southampton Memorial Hospital offers quality medical care. The Paul D. Camp community college is located in Franklin and 5 other higher education campuses are within a 60 mi radius. Everything you need is right down the street. Regency Estates is off Hwy 58, commuting distance from Norfolk Naval Shipyard, Coast Guard Base Portsmouth and Naval Medical Center Portsmouth as well as Langley AFB. Come take a drive out of the busy-ness of the city and imagine yourself at home in the beauty of the Franklin countryside. Call us today to move your dreams to reality! Send me more information about the Regency Estates new home community. Our agents gladly offer FREE property tours of Regency Estates, Franklin and homebuyer consultations to all serious buyers. Our Franklin SH Pro is prepared to represent you and your interests so you can move into your dream home.